AUD 1,052 Excl. Duties / Taxes. This Marquise diamond is 0.31 carat in weight, and comes with Very Good polish and Very Good symmetry, as verified from an independent gemological laboratory. The diamond is graded E in colour, and has a clarity grade of VS2. The diamond's GIA grading report number is 3315862815, which will detail further its specifications and measurements, and will also come with the purchase of the stone. AUD 1,135 Excl. Duties / Taxes. This Marquise diamond is 0.33 carat in weight, and comes with Very Good polish and Very Good symmetry, as verified from an independent gemological laboratory. The diamond is graded F in colour, and has a clarity grade of VS2. The diamond's GIA grading report number is 2307299164, which will detail further its specifications and measurements, and will also come with the purchase of the stone. AUD 1,036 Excl. Duties / Taxes. This Marquise diamond is 0.6 carat in weight, and comes with Good polish and Good symmetry, as verified from an independent gemological laboratory. The diamond is graded M in colour, and has a clarity grade of SI2. The diamond's GIA grading report number is 1186469582, which will detail further its specifications and measurements, and will also come with the purchase of the stone. This Marquise diamond is 0.3 carat in weight, and comes with Excellent polish and Very Good symmetry, as verified from an independent gemological laboratory. The diamond is graded D in colour, and has a clarity grade of VS1. The diamond's GIA grading report number is 2294896530, which will detail further its specifications and measurements, and will also come with the purchase of the stone. AUD 3,312 Excl. Duties / Taxes. This Marquise diamond is 0.78 carat in weight, and comes with Good polish and Very Good symmetry, as verified from an independent gemological laboratory. The diamond is graded D in colour, and has a clarity grade of SI2. The diamond's GIA grading report number is 1162656141, which will detail further its specifications and measurements, and will also come with the purchase of the stone. AUD 3,001 Excl. Duties / Taxes. This Marquise diamond is 1.14 carat in weight, and comes with Very Good polish and Good symmetry, as verified from an independent gemological laboratory. The diamond is graded M in colour, and has a clarity grade of VS2. The diamond's GIA grading report number is 6203010904, which will detail further its specifications and measurements, and will also come with the purchase of the stone. AUD 11,688 Excl. Duties / Taxes. 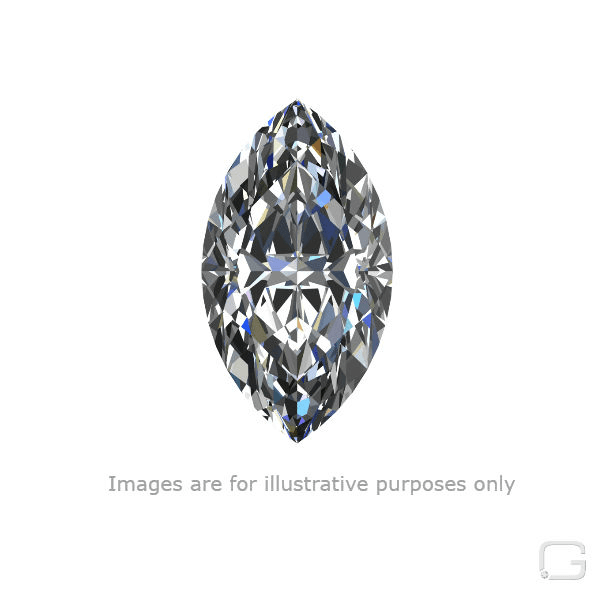 This Marquise diamond is 1.06 carat in weight, and comes with Excellent polish and Excellent symmetry, as verified from an independent gemological laboratory. The diamond is graded D in colour, and has a clarity grade of VVS1. The diamond's GIA grading report number is 5201104262, which will detail further its specifications and measurements, and will also come with the purchase of the stone. This Marquise diamond is 0.3 carat in weight, and comes with Very Good polish and Very Good symmetry, as verified from an independent gemological laboratory. The diamond is graded F in colour, and has a clarity grade of SI1. The diamond's GIA grading report number is 6295900301, which will detail further its specifications and measurements, and will also come with the purchase of the stone. This Marquise diamond is 0.31 carat in weight, and comes with Very Good polish and Good symmetry, as verified from an independent gemological laboratory. The diamond is graded F in colour, and has a clarity grade of VS2. The diamond's GIA grading report number is 6312348671, which will detail further its specifications and measurements, and will also come with the purchase of the stone. AUD 2,114 Excl. Duties / Taxes. This Marquise diamond is 0.52 carat in weight, and comes with Excellent polish and Very Good symmetry, as verified from an independent gemological laboratory. The diamond is graded F in colour, and has a clarity grade of SI1. The diamond's GIA grading report number is 2224217586, which will detail further its specifications and measurements, and will also come with the purchase of the stone. This Marquise diamond is 0.41 carat in weight, and comes with Good polish and Good symmetry, as verified from an independent gemological laboratory. The diamond is graded D in colour, and has a clarity grade of VS1. The diamond's GIA grading report number is 2297490408, which will detail further its specifications and measurements, and will also come with the purchase of the stone. AUD 1,302 Excl. Duties / Taxes. This Marquise diamond is 0.33 carat in weight, and comes with Excellent polish and Very Good symmetry, as verified from an independent gemological laboratory. The diamond is graded D in colour, and has a clarity grade of VVS1. The diamond's GIA grading report number is 2294405191, which will detail further its specifications and measurements, and will also come with the purchase of the stone. AUD 2,288 Excl. Duties / Taxes. This Marquise diamond is 0.7 carat in weight, and comes with Excellent polish and Excellent symmetry, as verified from an independent gemological laboratory. The diamond is graded J in colour, and has a clarity grade of VVS1. The diamond's GIA grading report number is 1275776711, which will detail further its specifications and measurements, and will also come with the purchase of the stone. AUD 1,159 Excl. Duties / Taxes. This Marquise diamond is 0.3 carat in weight, and comes with Very Good polish and Very Good symmetry, as verified from an independent gemological laboratory. The diamond is graded E in colour, and has a clarity grade of VVS2. The diamond's GIA grading report number is 6325226153, which will detail further its specifications and measurements, and will also come with the purchase of the stone. AUD 3,820 Excl. Duties / Taxes. This Marquise diamond is 0.74 carat in weight, and comes with Excellent polish and Very Good symmetry, as verified from an independent gemological laboratory. The diamond is graded F in colour, and has a clarity grade of VVS2. The diamond's GIA grading report number is 1275564611, which will detail further its specifications and measurements, and will also come with the purchase of the stone. This Marquise diamond is 0.31 carat in weight, and comes with Very Good polish and Good symmetry, as verified from an independent gemological laboratory. The diamond is graded E in colour, and has a clarity grade of VS1. The diamond's GIA grading report number is 2316950547, which will detail further its specifications and measurements, and will also come with the purchase of the stone. AUD 7,451 Excl. Duties / Taxes. This Marquise diamond is 1.35 carat in weight, and comes with Very Good polish and Very Good symmetry, as verified from an independent gemological laboratory. The diamond is graded I in colour, and has a clarity grade of SI1. The diamond's IGI grading report number is F1N52420, which will detail further its specifications and measurements, and will also come with the purchase of the stone. This Marquise diamond is 0.3 carat in weight, and comes with Very Good polish and Good symmetry, as verified from an independent gemological laboratory. The diamond is graded D in colour, and has a clarity grade of VS1. The diamond's GIA grading report number is 5293806759, which will detail further its specifications and measurements, and will also come with the purchase of the stone. AUD 1,207 Excl. Duties / Taxes. This Marquise diamond is 0.31 carat in weight, and comes with Very Good polish and Very Good symmetry, as verified from an independent gemological laboratory. The diamond is graded F in colour, and has a clarity grade of VVS1. The diamond's GIA grading report number is 2296895093, which will detail further its specifications and measurements, and will also come with the purchase of the stone. AUD 2,153 Excl. Duties / Taxes. This Marquise diamond is 0.51 carat in weight, and comes with Excellent polish and Very Good symmetry, as verified from an independent gemological laboratory. The diamond is graded E in colour, and has a clarity grade of IF. The diamond's GIA grading report number is 1289258220, which will detail further its specifications and measurements, and will also come with the purchase of the stone. This Marquise diamond is 0.3 carat in weight, and comes with Very Good polish and Very Good symmetry, as verified from an independent gemological laboratory. The diamond is graded I in colour, and has a clarity grade of VS1. The diamond's GIA grading report number is 7298735585, which will detail further its specifications and measurements, and will also come with the purchase of the stone. AUD 3,265 Excl. Duties / Taxes. This Marquise diamond is 0.67 carat in weight, and comes with Very Good polish and Good symmetry, as verified from an independent gemological laboratory. The diamond is graded D in colour, and has a clarity grade of VS2. The diamond's GIA grading report number is 2155751200, which will detail further its specifications and measurements, and will also come with the purchase of the stone. AUD 1,604 Excl. Duties / Taxes. This Marquise diamond is 0.41 carat in weight, and comes with Good polish and Good symmetry, as verified from an independent gemological laboratory. The diamond is graded D in colour, and has a clarity grade of VS1. The diamond's GIA grading report number is 2298253628, which will detail further its specifications and measurements, and will also come with the purchase of the stone.